Another Chima vehicle/craft set with a 2-in-1 feature, this one airing almost uncomfortably on the Inception side of things. I'm a fan of one of the minifigs, but the rest of this set leaves me a bit unsatisfied. Stop Vardy fleeing with the CHI in his super-cool Ice Vulture Glider! Evil Vardy has stolen the CHI and is escaping in his super-cool Ice Vulture Glider! Strap Lundor into his weapon station and fight ice with fire using his smoking-hot armory. Watch out for the glider’s huge wings and ice-blue claws and evade the dual flick missiles fired from either flank. But beware – just when you think you’ve got Vardy trapped, he could detach his flyer and speed away with the precious CHI! 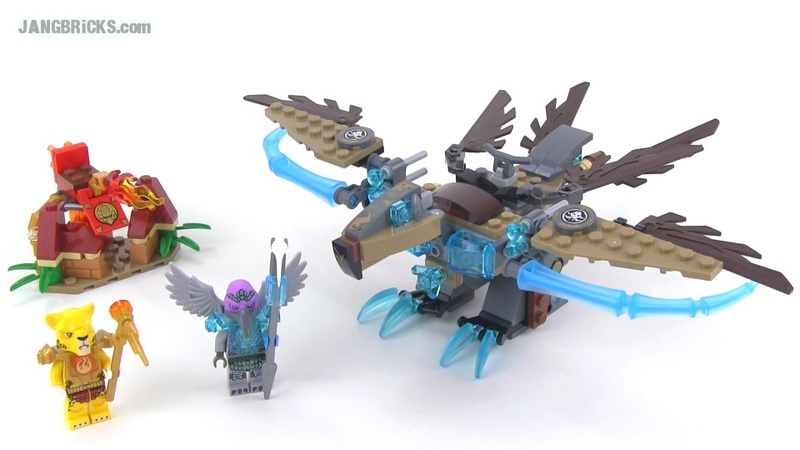 Ice Vulture Glider features huge talons, dual flick missiles on each side, posable wings and claws, translucent elements, plus a detachable flyer!